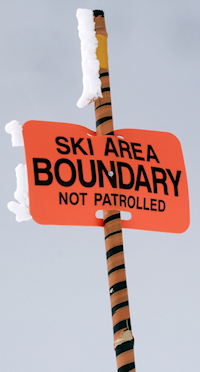 The most popular educational programs taught by New Hampshire Region Ski Patrol are the courses associated with becoming a SENIOR PATROLLER. Two types of Senior Patrollers exist, those who remain dedicated to first aid emergency care, become Senior Patrollers; and those who choose a more extensive training program adding a higher level of skiing/snowboarding and a higher level of patient emergency transportation become Senior Alpine Patrollers. Find out more about both training and examination programs. Certified Patrollers are the next level above Senior Patrollers. Not only must they be proficient in first aid, emergency medical management and emergency transportation — but all the additional aspects of the Ski Patrolling profession must be mastered as well: low angle rope rescue; avalanche rescue, patrol director management; lift evacuation; and hill safety preparation. To inquire about the process of becoming a Certified Patroller, follow the link to find out more. Young Adult Patrollers are high school students who have chosen to volunteer their community service hours to the skiing public of New Hampshire. Students 15 years old and up, who are willing to learn first-responder level first aid, and who enjoy snowboarding or skiing are sought for NH Region’s Young Adult Patroller Program. To discover if you have what it takes to dedicate yourself to this program, click the button, and reach out to the Advisor leading the group. Most of New Hampshire’s young adult participants, upon graduation, head off to college seeking careers in nursing and medicine. New Hampshire has only one Nordic-Backcountry member patrol — Jackson Cross Country. Situated within the town limits of Jackson, nestled in among Mt. Washington, and reaching up to the edge of Wildcat Mountain Ski Area, Jackson XC delivers hundreds of miles of maintained cross country ski trails at all ability levels. They are always seeking patrollers with a love for both cross country skiing and being a Samaritan on the snow, providing life-saving first aid. Mountain Hosts are skiing at many of the New Hampshire Region member resorts. They assist ski patrollers with on-mountain activities and act as ambassadors to the skiing public. Typically uniformed and on the snow, Mountain Hosts are trained in first aid and provide additional assistance when needed. Most Ski Patrollers start out as Mountain Hosts during their training program. If you are thinking of becoming a Ski patroller, joining as a Mountain Host will give you a detailed look at the life of a Ski Patroller. Alumni patrollers are made up of individuals dedicated to the National Ski Patrol organization who may no longer actively patrol on the snow. Perhaps their career has taken them out of state where no skiing opportunities exist. Perhaps they are too busy with family life and plan to return. Alumni allows in-active patrollers to continue supporting the NSP in many ways. If you have retired from NSP and want to return to join the Alumni, check out what they are doing in New Hampshire.